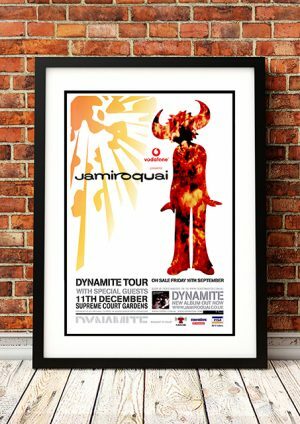 Classic Jamiroquai Band Concert Posters and Memorabilia! Buy Online Now! Active since the early ’90s, Jamiroquai have amassed a steady stream of hits in their native U.K. and experienced chart success in just about every other area of the world, with an irresistible blend of house rhythms and ’70s-era soul/funk (the latter, especially, leading early on to claims of Stevie Wonderimitations). The band has gone through several lineup changes during its career, but through it all, their leader has remained singer/songwriter Jason Kay (aka J.K.). Born on December 30, 1969, in Stretford, Manchester, Kay‘s mother, Karen, was a jazz singer who regularly performed at nightclubs, and in the ’70s had her own TV show. After leaving home at the age of 15, Kay found himself homeless and in trouble with the law (by committing petty crimes to get by). After a near-death experience (where he was attacked and stabbed) and being arrested for a crime he did not commit, Kay decided to return home, where he chose to pursue a legitimate career over crime: music. Kay didn’t have a band to back up his compositions, but he quickly came up with his future project’s name, Jamiroquai, a name that combined the name of a Native American tribe (the Iroquois) along with the music-based word, jam. We stock some awesome Jamiroquai Band Concert Posters.